Today I'm drinking Longshot Honey B's Lavender Ale brewed by The Boston Beer Company in Boston, Cincinnati or Brein (NO I) gsville, Pennsylvania. This is the second from this Homebrew Contest that I've tried, after hating on the Friar Hop Ale a few weeks back. Honey B's was created by Samuel Adams employee Caitlin Declercq from California, and is an ale brewed with lavender and honey. 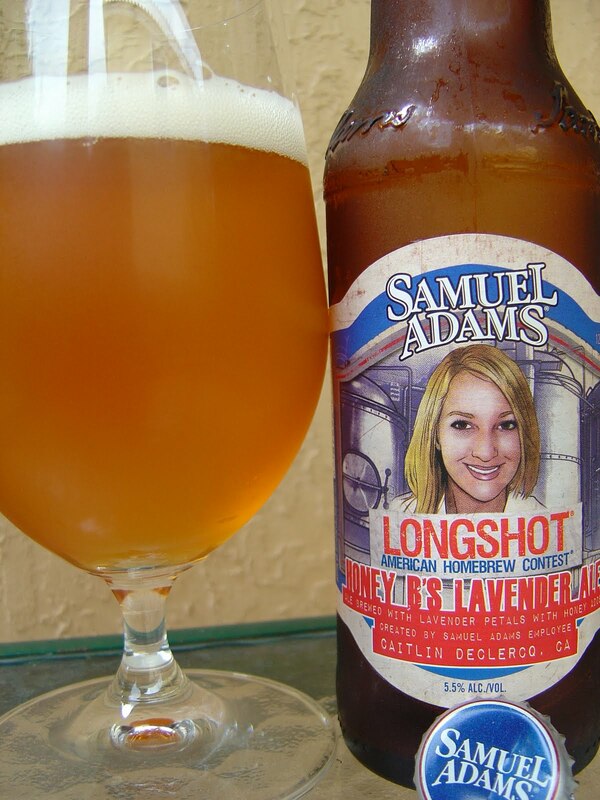 She is pictured on the front of the label as well. Enjoy before September, 2011. Sweet honey and flowery aroma, not surprisingly. Sweet honey flavors dominate up front. A tiny amount of carbonation and citrus makes a stab at thinning out that sweetness but fails miserably. Up next, lavender. You might think you're licking an entire flower, the flower part and the green plant part, though the latter could just be that normal Sam Adams herbal flavor that is in all of their beers. Much too sweet; much too flowery. The 5.5% alcohol is noticeable only toward the end as it dries things out quite a bit. Not refreshing. Coats the mouth completely and uncomfortably. Carbonation is great. Flavors are good, too, just way overdone. Another pass.